When Is Heavy Lifting Detrimental To Your Game? I mentioned on Morning Drive that the blessing in Tiger's back problems may be that he's forced to back off the heavy weightlifting that his physique suggests he's been partaking in over the winter break. This is in full contrast to most of his peers who have backed off the heavy stuff and have shifted to more core work. 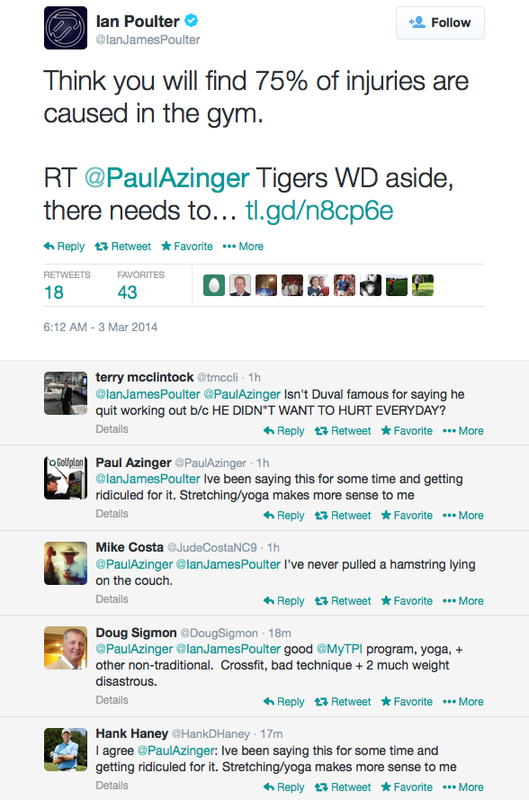 An interesting conversation on Twitter started the day after Tiger's WD with a Paul Azinger Tweet, and here are follow-ups from Ian Poulter and Hank Haney. You can view the full conversation here.